Description: Lack of time may be the single most commonly experienced problem among American faculty. 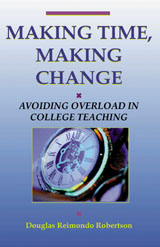 It is fair to say that the overwhelming majority of the roughly 400,000 full time faculty in American colleges and universities feel overloaded in their teaching lives; they perceive that they do not have time to do their basic faculty duties properly; and they believe that overload goes with the job. We complain yet we do not reflect on and evaluate our paradigms for how we use our time. Perhaps a pernicious norm has evolved: anyone not complaining about being overwhelmed is suspect. We act as if we have no choice. Einstein once remarked, "Insanity is doing the same thing over and over again and expecting different results." A Lakota Sioux saying puts the idea in concrete terms, "When your horse is dead, the proper strategy is to dismount." When it comes to avoiding overload, many of us sit on our dead horses kicking them in the sides over and over again, insanely, wondering why we don't get anywhere. However, we do have choices about how we use our time. Einstein suggested a way to discover our choices when he further observed, "Problems cannot be solved at the same level of awareness that created them." Essentially, that is the objective of this book: to elevate our awareness of how we use our time and how we might improve that use of time. We need to shift our perspective on using time from subject (a perspective from which we act naively) to object (a perspective on which we act intentionally). The tool that we will use to stimulate this shift in awareness comes from a vintage analysis of systems theory and research and focuses on managing the boundaries of our teaching selves better. In Making Time, Making Change, author Douglas Reimondo Robertson leads you on the road to a more rewarding, and less harried, teaching life! Douglas Reimondo Robertson (Ph.D., Syracuse University, 1978) is Director of the Teaching and Learning Center and Professor of Geography and Educational Leadership at Eastern Kentucky University in Richmond, Kentucky. He has authored over 70 scholarly publications and presentations, including a well-received book on intentional change in adult life, which has entered its 3rd printing (Self-Directed Growth, 1988). Professor Robertson has helped to start three university faculty development centers (Portland State University, University of Nevada - Las Vegas, and Eastern Kentucky University), and has served as founding director at two of the centers (UNLV and EKU). He is the Senior Editor of the book series on college teaching published by New Forums Press. Recently, he was named to a four-year term as Editor of To Improve the Academy (two years as Associate Editor and two years as Editor). He sits on the Editorial Board of the Journal on Excellence in College Teaching, as well as providing frequent guest reviews for Innovative Higher Education. He is a founding member of the Editorial Board for a new electronic and print journal, The Kentucky Journal on Excellence in College Teaching and Learning. In addition, he has served on the Awards Committee for the Professional and Organizational Development (POD) Network in Higher Education and has chaired its Regional Organizations Sub-Committee. An active consultant since the 1970s, Dr. Robertson has provided over 110 trainings or consultations to a wide range of educational, health care, human service, governmental, and business organizations. Recently, he received a five year appointment as a Fulbright Senior Specialist and will be providing consultations for overseas universities through the J. William Fulbright Foreign Scholarship Board (FSB), Bureau of Education and Cultural Affairs of the Department of State (ECA), and the Council for International Exchange of Scholars (CIES).